One thing can be said about Tioga's designs these days: the company knows how to take risks. Consider their Zero pedals, flat pedals that are about as thick as a dime, or the unique knob profiles on their Psycho Genius tires, which look more like the pads on a gecko's feet than the standard squares and chevrons on most tires. Tioga takes chances. The company, however, is adamant that this is not merely a case of being different for the sake of being different—that their products are different because the company is tackling the problems riders face from a different angle. 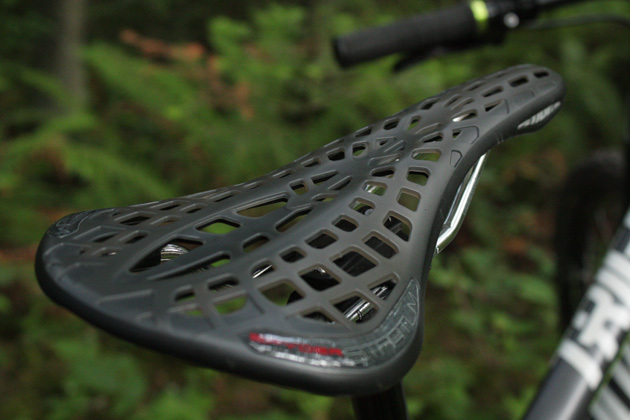 Consider their new Spyder Stratum saddle. Tioga set out to make a more comfortable saddle and rather than fiddle about with the shape of the saddle or the padding material, they asked themselves how they could make a saddle that offered better shock damping than the saddles already on the market. The result is what you see here. "Mainstream saddle designs are excellent for energy transfer from your legs to your pedals, but horrible for energy absorption" explains Tioga's Kai Cheng, "Stiff saddles are very efficient at transferring energy, but most riders are putting up with a lot of abuse in exchange for that great transfer. 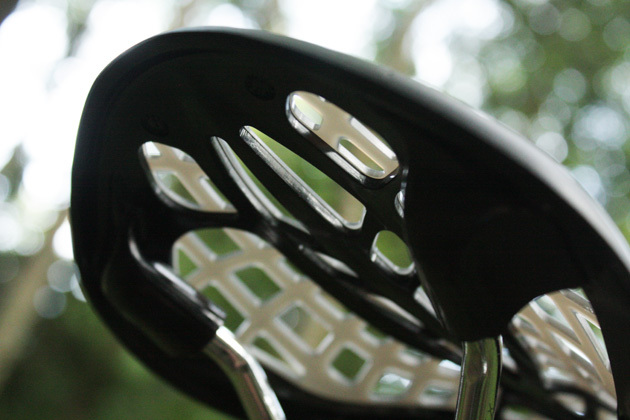 We feel that mainstream saddle design misses the point." 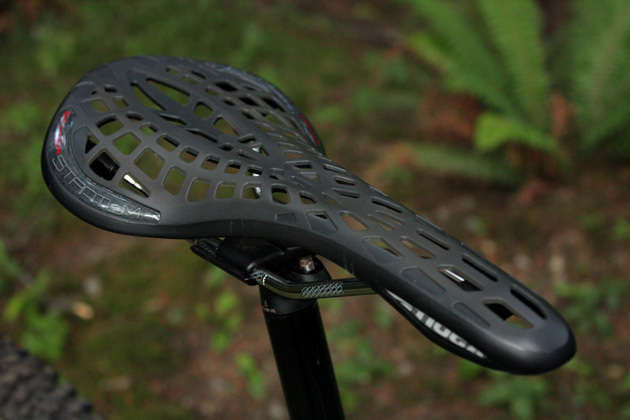 The point, according to Tioga, is to create a saddle that transfers energy and better absorbs the countless impacts transferred from your rear wheel to your rear end during the course of the ride. The traditional approach to making saddles more comfortable is to add more padding. "Foam padding isn't a very good shock absorber," explains Cheng. "There is only 15 millimeters of foam padding in a typical performance saddle and it compresses quickly and rebounds slowly—making it an inefficient shock absorber. Foam padding's level of absorption is proportional to its mass – if you want it to absorb more impacts, you need to make it thicker and that also means heavier." With the Spyder Stratum saddle, Tioga ditched the padding entirely, replacing it with flexile, dual layer web covering that conforms to the rider's weight, yet remains pliable and active, allowing it to absorb higher levels of energy from bumps and with greater frequency than conventional saddles. The dual layer design allows Tioga to make a stronger saddle while also controlling just how much the saddle flexes. While Tioga already had a web-style saddle in their line up, they admit that it had its shortcomings—it was brittle. To make the earlier single-layer version flex, they had to make it thin and that didn't bode well for durability. The new dual layer version (Tioga calls it DualTech) is said to offer better durability. The top layer is a spring and the bottom layer, what looks like a series of darker trusses, reinforces the more flexible upper layer, helping to control how much the upper layer compresses. The design is stronger (it passes EN standards for durability) and allows Tioga to tune how much flex each saddle will offer. The new Spyder Stratum is aimed at both road riders and cross-country mountain bikers, but the company could easily broaden their mountain offerings with the same basic design framework. There are currently two versions of this saddle, one with chromoly rails (190 grams and $125) and the other with carbon fiber rails (120 grams and $190). The carbon version does have rider weight limit of 240 pounds, but this is due to the carbon rails and not the DualTech saddle design itself. Like any red-blooded American kid who grew up in the `80s, I spent a lot of time riding plastic BMX saddles that did a good job of reducing my potential to create babies and not a whole lot of good when it came time to sit down and actually pedal. Tioga insists that there's no similarity between the their saddle and the unforgiving plastic platforms of doom–that the two species are, in fact, polar opposites. Is the Spyder Stratum truly as comfortable as they say? We'll see. I just swapped the WTB Volt saddle for the Spyder and will be giving it plenty of dirt time in the near future. For his part, Cheng is convinced that Tioga is on to something here. "As radical as this saddle looks," says Cheng, "there is a purpose to it. It's not radical looking for the sake of being radical looking. Sure, we have a tendency to make unorthodox products, but there is a legitimate performance purpose to not being mainstream."